Choose a car with high safety ratings. Not only will a safe car help protect you and your passengers from serious injury, it also protects the environment by cutting down on the amount of glass and debris littering the roadways. By helping to cut down on the overall number of traffic accidents, it helps prevent things like accident-caused oil spills or chemical spills which have their own environmental and public safety implications. Take care of your car. 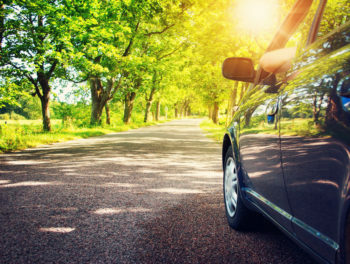 Adhering to the manufacturer’s recommended maintenance schedule makes your car more eco-friendly by keeping it running efficiently, and preventing fluid leaks and squeaky parts. It also gives your car the better chance of a long road life. Practice eco-driving. Yes, you can even make your driving more eco-conscientious by not driving faster than you need to, coasting on hills, and braking smoothly as much as possible. Driving in this way also puts less wear and tear on your car, which goes back to taking good care of your car. Lighten the load and use good quality fuel. Carting around unnecessary weight reduces gas mileage. And speaking of gas, using higher quality gas keeps engine parts clean and keeps them running smoothly. Don’t drive alone. Carpooling results in fewer cars on the road, and lets you and a friend trade-off on driving, saving wear-and-tear and maintenance on your own cars. Even small changes make a difference, and just maybe, your own eco-friendly actions will inspire others to expand their efforts too. If you’d like to explore the idea of living in a green community in Southern California or Nevada, contact us.